The cost of traveling is probably the reason I’ve heard most often why people don’t travel (along with not having the time, but that’s another discussion). But traveling doesn’t have to be expensive. Sure, if you want a certain standard of travel and luxury, then budget traveling might not be as feasible. As a young person who has very few things holding me down right now, however, [budget] traveling is what I tend to focus on. I want to see as much of the world, as cheaply as possible ;). Last year, while working more than full time, I traveled internationally twice, took multiple road trips, as well as a few domestic flights for long weekends. And this year is a whole other story (living in Europe has its perks)! Often people ask how I afford to travel so often. While yes, I do spend quite a bit of money traveling, I probably don’t spend as much money in other areas of my life that many people might splurge in (alcohol and food are two!) — I’ve made travel a priority. Granted, this has changed slightly since getting married (my husband and I have slightly different priorities). But I still try to stick to my budget ways, especially for solo trips. Budget for travel. Or tell your money where to go, as Dave Ramsey says. And I tell mine to go to plane tickets ;). When I was single livin’, I’d set aside money for travel after all my non-negotiables were accounted for (rent, groceries, giving, etc.). The amount changed each month based on what else I had going on, but I’m always aware of how much I can afford to spend. Budgeting for two people (who have very different spending habits) is a bit more challenging, but we still set money for travel aside in our budget! Have flexible travel dates. If you are able to, the day of the week you travel on can make a big price difference. I’ve found that Tuesdays and Wednesdays tend to have the best prices. But I always check the “+/- 3 days” option when searching for fares just in case. Fly on off season. Take advantage of local adventures over the summer and around major holidays when plane tickets are often more expensive. If you fly at less “desirable” times of the year, you might be able to score some sweet deals. Keep a look out for mistake fairs or cheap specials. If you aren’t picky about your destination, you can get some cheap flights or even vacation packages (I’ve never bought a package, but I’ve seen them!). And the best way to do this is to sign up for email lists or Facebook pages that do the research for you like Thrifty Travelers and Travel Pirates. Setup price drop alerts. If you have a specific destination in mind, use Kayak or another flight search website to set up an alert for when the ticket price drops. Just cause the tickets are expensive now doesn’t mean it will stay that way (flash sales can happen!). Look at other airports. If you live near Philly, consider flying out of Newark or Baltimore. Not all budget airlines fly out of all airports, so it doesn’t hurt to check the “airports near by” option when you are searching for tickets. Use third party sites. 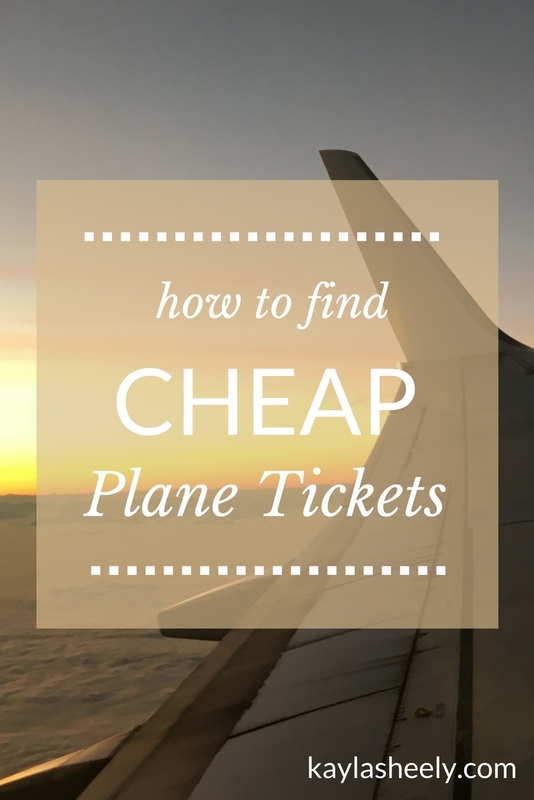 Sites like Kayak and even Google Flights can be great tools in searching for cheap tickets. Don’t assume the first flights you see are the only ones out there! It is also helpful once you’ve used the third party site to double check on the actual airline’s site to make sure you are getting the best deal. Be willing to go alone. It can be hard to find people to go with you, especially if you are banking on flexible (or last minute) travel dates. Taking the jump to solo travel can save you lots — you only have your schedule and budget to rely on! Plus solo traveling can be a fun, challenge, growing experience. Consider other transportation costs. Cheap flights are great, but if you have to buy a pricey bus ticket to get from that remote airport to your hostel, it may not be worth it. Make sure you consider transportation from the airport to the main city in addition to the ticket price. Alright, I know this list isn’t exhaustive. What tips would you add to the list? And what’s the cheapest plane ticket you’ve ever snagged? I’d love to hear in the comments below! That’s so true! I’ve found the same thing!